Do you know how to make gumbo recipes or exactly what they are? Although you are finding these recipes under soups and referred to as soup, the best are made like thick stews. Good gumbos are cooked for two hours or longer to blend the flavors. These thick dark soups are a mixture of many different ingredients; anything you like can be thrown in the pot. Some typical ingredients found in these recipes would be an assortment of vegetables, meats (usually chicken and sausages) and rice. The seafood gumbos (I love a mix of seafood) have a variety of seafood such as oysters, shrimp, crab and any kind available. 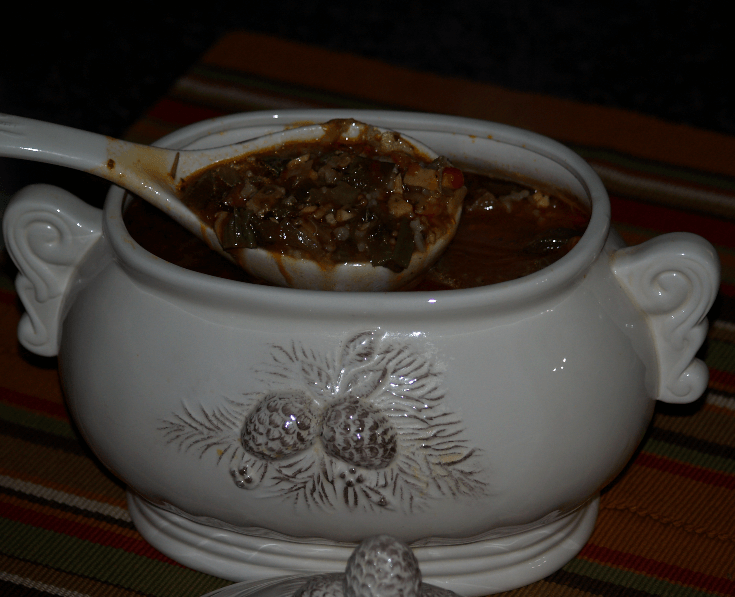 Gumbos are first thickened with a dark roux, and then they are thickened with okra or file powder. For me the thickening is essential; the taste is not the same without the thickening. I do not call the thin versions gumbo but instead I call them soups. Years ago I worked with a chef from New Orleans; he made the best seafood gumbo. The flavor of his soup still leaves me dreaming of that great taste. It is unbelievable! If you are learning how to make gumbo recipes you will often find file powder included in the list of ingredients. This spicy herb is made from ground sassafras leaves. Since childhood I always loved sassafras tea. My dad would take me and my siblings with him to gather the roots from the woods to make this delicious tea. It tasted so good in the cold wintertime. When I first started using file powder, I did not know where it came from. I bought it because of the spicy taste and I did not even realize that is actually a thickener for soups and stews. I cannot remember greens in the gumbo that I tried and loved and I have not added them to what I have made. I do add different greens to many of my soups so I can see that they would enhance the flavor. Many locals of New Orleans believe that greens are a necessary part of the dish. They say there is a tradition of adding the different greens to represent your new friends, so you might want to try them. 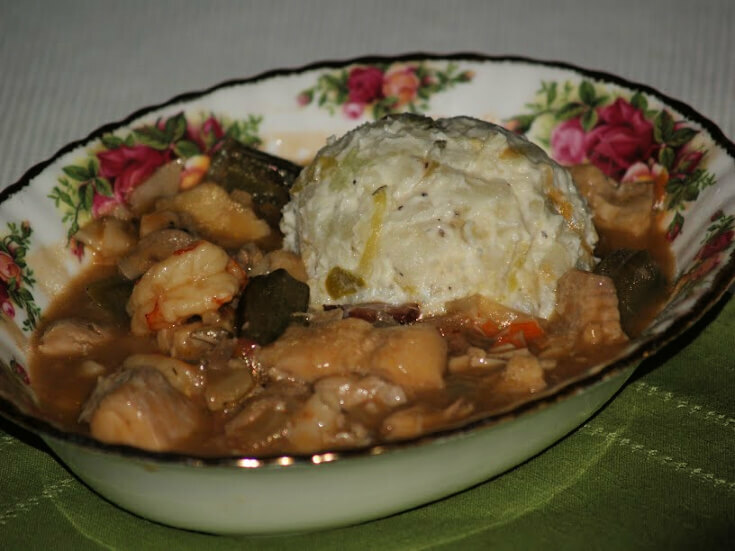 If you are learning how to make gumbo recipes, you need to know a little about the history. These recipes dates back to the eighteen hundreds and takes us to the fabulous food cuisine of New Orleans. This is the oldest dish evolving out of New Orleans; along with jambalaya, the muffaletta sandwich and po boys it has become famous from coast to coast. Although this is the region so famous for these flavorful dishes like the gumbos, many of the ingredients, spices and techniques evolved from the cookery of the French, African, Italian, Spanish, German and the Choctaw Indians. Southern gumbo recipes start with a roux made by combining flour and oil. The roux is cooked and stirred over medium heat until it becomes caramel in color. Now is when the vegetables are added for seasoning; onion, garlic, peppers, celery, etc. For me, okra is a necessity to all gumbo recipes. Fresh is best but I often use frozen because I always have it on hand. Some recipes tell you to brown the okra first in a skillet but more often simply add it. I cannot really tell any difference. Gumbo is very flavorful and spicy. This flavor is accomplished by long slow cooking after adding the liquid, vegetables, spices and herbs; everything except the seafood and cooked meats. Seafood is added at the end allowing enough time to cook it. Too much cooking makes it tough. I use seafood fresh, frozen (Thawed first) or in cans regardless of what the recipe calls for. In some areas it is hard to buy “fresh” all the time. My gumbo is always delicious. The “spiciness” of gumbo recipes can be adjusted by adjusting ingredients like hot sauce and red pepper so taste it before serving and make adjustments of the heat, salt and pepper. Gumbo file is an option you could try in all your gumbo recipes. It adds extra flavor and also adds more thickness. 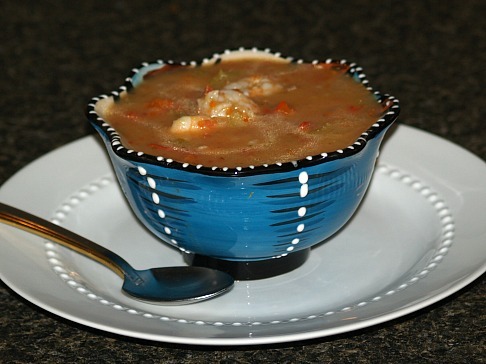 For me a plain bowl of gumbo is very satisfying but most gumbo recipes instruct you to serve over rice. I have been told by people of Louisiana the best way to eat gumbo is with a big scoop of potato salad. After trying their recommendation, I think I agree but I would always choose potatoes over rice! Either way, both rice and potatoes are quite filling but a simple bowl of gumbo leaves you wanting more. Combine flour and ½ CUP oil in a large Dutch oven or pot over medium heat. Cook and stir until mixture becomes caramel colored about 15 to 20 minutes. Stir in the celery, onion, bell pepper and garlic; cook 45 minutes stirring occasionally. Fry okra in 1 TABLESPOON oil in skillet until browned; add to pot stirring to blend. Add to the pot the chicken broth and next 11 ingredients stirring to blend. Bring mixture to a boil; REDUCE heat and simmer 2 hours 15 minutes stirring occasionally. NOTE: Do not cover; liquid will cook down some. Prepare all seafood and cooked meats; add to the gumbo. Return gumbo to a simmer; cook 15 to 20 minutes. NOTE: Seafood should be cooked and mixture thoroughly heated. Remove bay leaves and add gumbo file if desired; serve with rice or potato salad. Heat a little oil in a large skillet. Add the celery, onion, green pepper, jalapeno and garlic. Sauté on medium heat until vegetables are tender; set aside. In a large stock pot heat the oil over medium heat. Add the flour and blend to make a roux. Add the sautéed vegetables, chicken broth, Worcestershire sauce, tomatoes, bacon, bay leaves, thyme, rosemary, parsley, catsup, tomato sauce and canned tomatoes. Heat to a rolling boil stirring frequently; reduce heat and simmer for 20 minutes. Add the okra, seafood, chicken and sausage; simmer for 15 minutes longer. Add the salt, pepper and red pepper flakes to taste. NOTE: Remember to add the red pepper a very little at a time; the longer it sets the stronger and hotter it will become. Remove bay leaves and discard before serving. Serve over cooked rice. Melt butter in large heavy saucepan over medium heat; add ham and chicken. Cook and stir for 2 minutes; add okra, onion and green pepper and cook 5 minutes. Add garlic, tomatoes, chicken broth liquid from oysters, salt and pepper; bring to a boil. Simmer at least 1 hour stirring occasionally; add oysters and cook 1 to 2 minutes before serving. Cut ham, chicken, okra, onions, bell pepper and parsley into small pieces and fry in the bacon drippings. When browned add the boiling water; tomatoes, garlic, bay leaves, thyme, salt and pepper. Cook slowly 1 hour; add shrimp and crabmeat and cook 30 minutes. Add seafood seasoning and stir well. Remove from heat cool and refrigerate overnight. Reheat and serve over hot cooked rice. 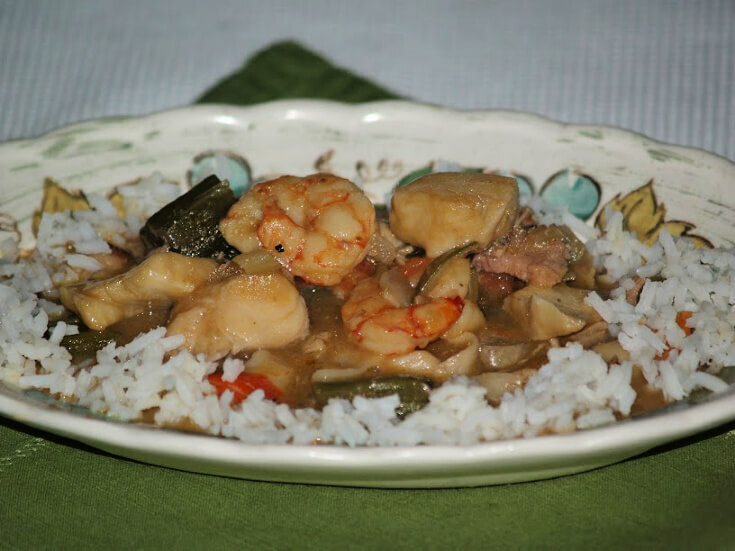 Although there is a rule for gumbo recipes not to use both okra and file powder in the same recipe, I found this very old one with both; it is also cooks in less time. 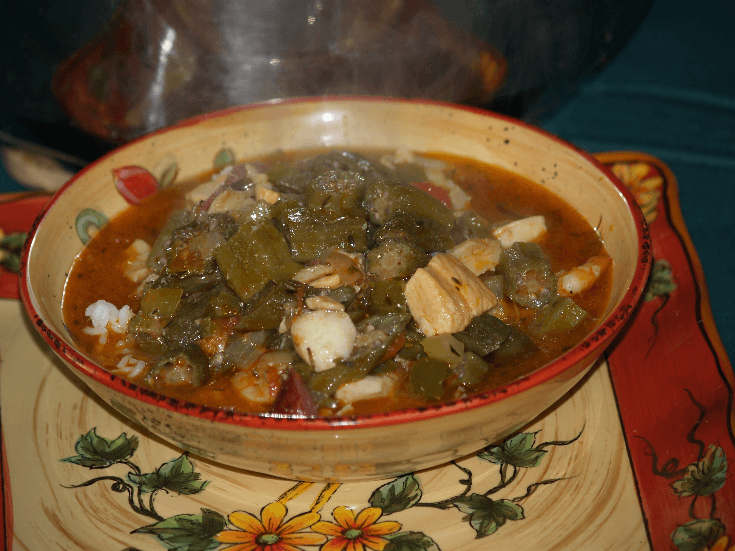 I made this gumbo very quickly and love the flavor. Melt butter in heavy pan; add onion, green pepper and celery and cook about 10 minutes. Add okra, tomatoes, parsley, bay leaf, broth and shrimp. Cover and simmer gently about 30 minutes; season to taste.